what was said in the heat of polemics? just like your table - on the floor? While your chair's strength is verticality". Look closely. Neck and head, frontal plane, soft edges, eyes, in most cases, are “blind”… Yet in the "Dorian Gray Series", the eyes are not only open, but beaming, bursting beyond the painted space, cutting instantly the distance to the viewer - penetrating, fascinating glance! Personae? Subjects? Heads? Busts? Faces? Saints? No! Most definitely - "Idols"! The sacred sculptures Moai from the Easter Island, who lost their cylinder shaped hats "pukao" made of basalt pumice of Puna Pao volcano…and pedestals on which they once sat. But for Elena Zolotnitsky a Pedestal, any Seat - a chair, stool, armchair, throne, holy seat - is not just furniture. ”A Chair” is an "Idol", equal to the sign of Man! There are earlier works by Elena Zolotnitsky where both symbols were present together on one canvas. In "Love Letter to Vermeer" and "Goldfinch" the Seat has not yet separated, disconnected with living creatures - the allusive prototypes of "Girl Reading the Letter" by Vermeer and "Goldfinch" by Fabricius. However in Elena Zolotnitsky’s paintings for quite a while these two kinds of symbols - heads and chairs - have been living independently from each other’s life, though in galleries one can see them hanging on the walls next to each other and seemingly communicating. Creative imagination easily reconfigures chairs and armchairs, playing freely and enthusiastically with their form. Edward Munch and Borisov-Musatov glorified the rockers, Gudon - Voltaire”s Chair; Klimt, Renoir, Boldini praised the Viennese Chair; Andy Warhol - an electric chair and Picasso seated his model in a “floppy-ears armchair”. Dali's sofa is shaped like lips of May West, American actress who became a scandalous diva of the 1930s. Jones' chair is the female body itself. Is the chair an object or a subject? Is it a personalized or depersonalized piece of furniture? What is a human being for the chair’s “mind”? René Magritte painted a chair with a brass tuba and antique female torso in his "Menacing Weather". It is full of harmony and on the background there is the sea shore, a symbolic representation of eternity. By contrast, Francis Bacon’s armchairs exclude any kind of harmony - they always look like cannibals. The characters from the pop art masterpiece by Allen Jones "Man Woman" on the contrary “absorbed” their chairs and are simply floating in space. Ionesco, the author of a tragicomedy "Chairs", wrote ”a chair is what is left of a man after he has stepped out of the room for a minute. A chair still keeps his warmth, follows all emotional contours of his body… but it is nothing without a man”. Vincent van Gogh gave us two monuments: Gauguin’s armchair and his own chair, both with pipes. His chair looks like it’s made of inexpensive wood; his pipe and pouch of tobacco are laying on it. It modesty contrasts with Gauguin’s armchair made with a sophisticated artistry, with a candle and book on it. The satin-scarlet sofa by Dali speaks of emancipation and sexual liberation; Rick Nilsson's "Red Chair" is about spiritual crisis, anxiety, the end-of-life experiences. Robert Falk's canvas of 1920 convey the fears of approaching tragedy, unavoidable future turmoil, and unforeseeable consequences of revolutionary political developments. Elena Zolotnitsky’s Chairs, portrayed in her new body of work called "Extinct Series", belong to a different tradition. Their symbolic nature is unfolded by her not through their form, composition, assemblage, or cultural significance of particular elements; color is the key instrument of her visual narration. It has a paramount importance! 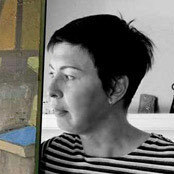 Elena Zolotnitsky’s artistic language is complex. Multilayered-ness dominates in it and it covers both her sophisticated artistic technique and concentrated saturation of meaning. She is drawing on the old masters, most of all on Rembrandt’s works, as well as on Malevich’s works, especially on those done shortly before his death. By using uniquely expressive combination of colors Elena Zolotnitsky generates super-thick and dense space in which she places chairs; that creates the effect that chairs are immersed into their own existence, live the life of their own, both physically and symbolically. Images of the chairs, or better to say, idols of the furniture created by Zolotnitsky belong not to the visual art, but the art of plasticity, in which abstracted forms, in as much as they are thematized as something tangible, colorful, and presented on canvas as object-like independent entities in space, constitute the content of art. Saturated or reduced colors accumulate a kind of energy around the chairs - exulting by times and pacifying by times. Zolotnitsky’s agitating and enflaming artistic execution captivates and dominates viewers’ imagination. There is no story per se. Chairs become the event in plasticity. Aiming at certain generalization and at the same time holding on expressive clarity throughout the painting, the painter of the "Extinct Series" manages to reach astonishing harmony between rather sizable masses by transforming them into events of plasticity. Elena Zolotnitsky’s artworks create sensation of contemplative serenity implying a thought of profound interconnection between cultural epochs. Zolotnitsky is able effectively to depict “depth” as the unity of space and time as well as the unity of rest and movement of the mass. Slepukhin is the founder and CEO of the the Publishing House "Evdokia"; where he was the editor-in-chief of the prestigious and well regarded literary almanac "White Crow" (2011-2016). Sergei Slepukhin is the author of studies and critical essays on the works of Thomas Mann, Henry Mann, Bruno Schultz, John Boydell, Wassily Kandinsky, George Gross, Vladimir Mayakovsky, Edward Lear, Andrei Nazarov. He is an active contributor for major literary publications in Russia.